Aviation Report already treated JASDF with an article (in Italian language) published on December 6, 2016, and accompanied by some great pictures of Heric Hsu; after more than 1 year, Aviation Report goes deeply into the Air Force mission and organization. In the past 15 months, many scenarios are changed in the eastern world: China is empowering new naval battle groups around her new STOVL aircraft carriers, the deployment of the first 5th generation fighter jet built outside the US, the stealth Chengdu J-20 equipped with air-to-air long-range missiles PL-12 and the challenges of North Korea. The international situation is game-changing for Japan that is still thinking to change the Country constitution in order to legitimate the increase of the budget for the defence and better face the threats launched by rivals. A signal is a rumour about the possible acquisition of the American stealth fighter Lockheed Martin F-35B Lightning II, the STOVL model, that could be carried in future on board the flat-deck “destroyers” class IZUMO. Other rumours say that there are studies to build new aircraft carriers, getting Japan in a new dimension never seen after the II World War and currently forbidden by the Article 9 of the Constitution. The current mission of JASF is to Preserve peace and stability, and independence. Defence is the “key”. 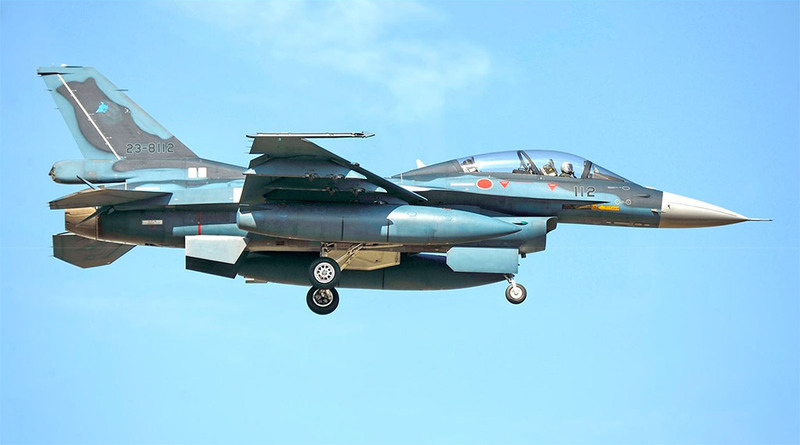 Defence capability made by JASDF wants to demonstrate the country’s intention and ability to deter external aggression, as well as repel an incursion. No other measures can replace this function. 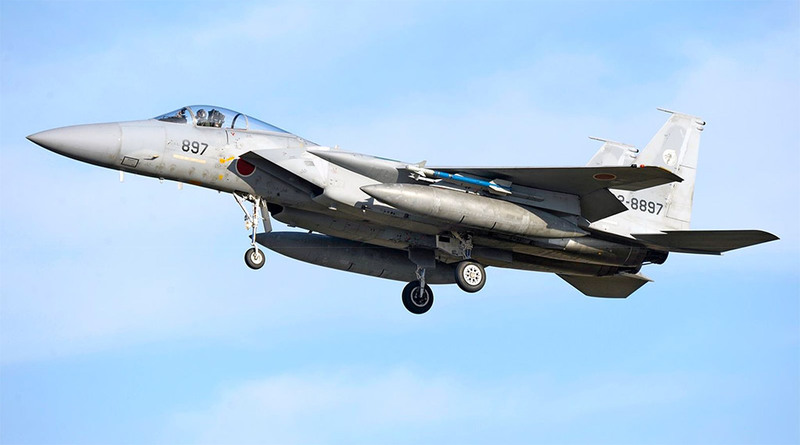 The defence capability of JASDF is a major force in determining the overall confrontation and it carries the central role in overcoming the military potential of the enemy in the air (called “Air Mastery”), while at the same time avoiding any major damage. Since “Air Mastery” also greatly affects ground and marine strategy, JASDF can be called the “Key” to Japan’s Defense fulfilling an important role that cannot be handled by any other organization, such as the immediate dispatch of fighters to intercept aircraft intruding into the national airspace. 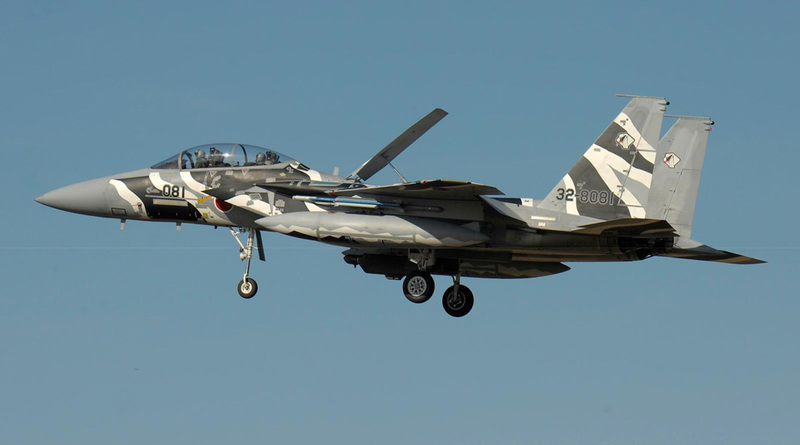 “JASDF carries out this mission day and night, in order to preserve the peace, stability, and independence of Japan”. JASDF was established on July 1, 1954, when the Defense Agency replaced the Security Agency, in order to bear the defence mission of Japan. Of the Ground Self-Defense Force (JGSDF), Maritime Self-Defense Force (JMSDF), and Air Self-Defense Force (JASDF), JASDF is the most recent department. There are about 48,000 Self-Defense officials and 3,000 administrative officials for a total of more than 50,000 pilots, airmen and support personnel. The Ministry of Defense and Self-Defense Force, centering on the armed organizations of the Ground, Maritime, and Air Self-Defense Forces, are organized with various organizations such as National Defense Academy, National Defense Medical College, National Institute for Defense Studies, Technical Research and Development Institute, Equipment Procurement and Construction Office, and Inspector General Office. JASDF established the “Air Staff Office” in Ichigaya, Tokyo. The “Air Defense Command” is the main force formation for air defence and covers all of Japan. The Air Staff Office is the chief organization for military service operations and includes the Chief of Staff of JASDF and his assistant agency. It works under the staff of the Minister of Defense. The Air Defense Command is the first-line troop to be given an air combat mission. It consists of the Air Defense Command, Air Defense Force and other directly controlled forces, in order to carry out command and operations in an integrated manner. The Air Support Command is the organization to support the Air Defense Command by carrying out air strategy. In addition to the headquarters, it consists of troops for air transportation, air control, weather, and maintenance. The Air Training Command is the organization that provides education to SDF members in an integrated manner, and the educational agency to carry out basic education and training, and teach expertise and skill necessary for a SDF member. The Air Development and Test Command is the organization for the development of the ever-changing experimental aircraft and equipment, aeromedicine, human engineering, and to carry out a wide range of research. 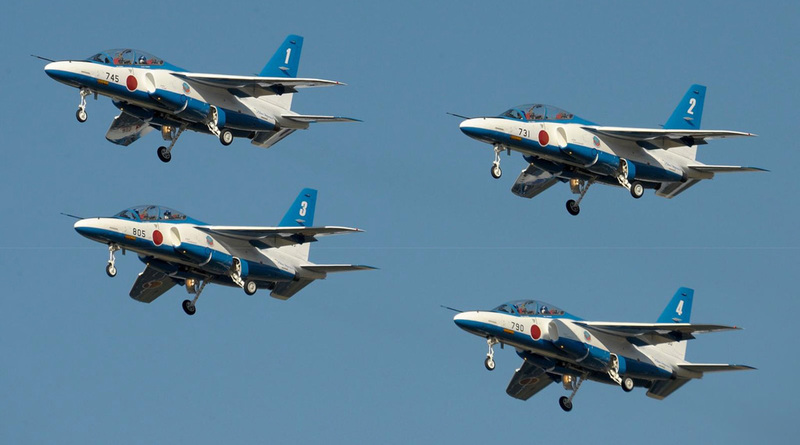 The Air Material Command of JASDF is the organization to control supply depots No.1, No.2, No.3, and No.4 of JASDF, and is in charge of the procurement, safe-keeping, recruitment, and maintenance of necessary fuel, ammunition, and equipment. In addition, there are other units and organizations such as the “Air System Communications Squadron”, “Air Central Musical Band”, “Air Staff College of JASDF “, “SDF District Hospitals in Misawa, Gifu, and Naha” and other minor entities that contribute to reach the missions of the armed force and grant the sustainability and the comforts of the personnel. As said, the main mission of JASDF is the defence of the Country, but it is also involved in case of natural disasters or incidents that require support by the air force also promoting the international cooperation activities. “Air Defense” guards the nation and its territory against an incursion by air, in airspace as far from the national territory as possible. Serious damage is inflicted on the enemy, thereby making an enemy attack from the air difficult to continue. When an emergency such as major disaster occurs, JASDF collaborates with each prefecture and carries out aerial reconnaissance, dispatch of necessary personnel, transportation of people and material supplies, etc. The Self-Defense Force supports efforts towards international peace through international peace cooperation works. Also, by promoting international cooperation through international disaster relief activities, etc, we aggressively carry out activities for the peace and stability of the international community. Our goal is an organization that can be completely trusted, both domestically and internationally, by reliably accomplishing this mission. 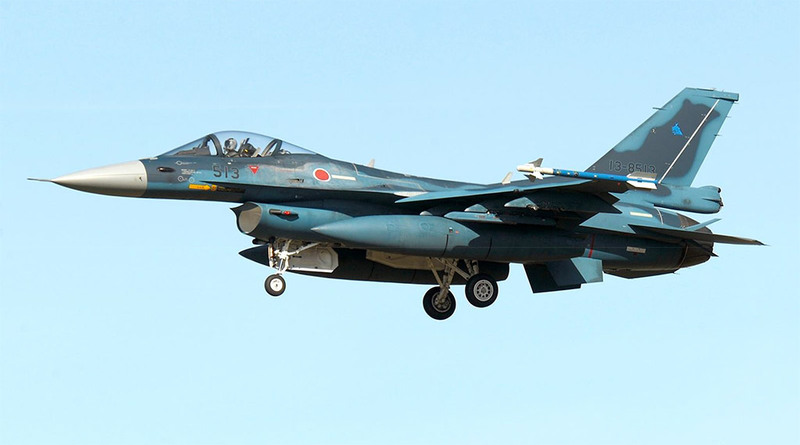 Demonstrating swift and comprehensive combat strength by maintaining a state of immediate readiness and the constant accumulation of information, Japan (through JASDF) grants the security of the citizen, preserve the economic exclusive areas and the territorial integrity. In the event of an armed attack, and according to the geographic features of Japan surrounded by the ocean, standard procedures are to carry out an air strike by aircraft and missiles and then repeat the air strike. Characteristics of air defence strategy, are that the invading forces decide the time, district, and method of attack, and the initial military response greatly influences the overall strategy. Thus swift and comprehensive combat efficiency is needed from the initial stages of engagement and is achieved by maintaining a state of immediate readiness and by the constant accumulation of information. In the actual air defence, a swift response to an enemy aerial attack allows for engagement in airspace as far from our national territory as possible and prevents harm to the nation and its territory. And, by inflicting damage to the enemy, it is difficult for the enemy to continue its aerial attack. The strategy for air defence during an aerial incursion includes “detect any invading aircraft”, “identify the detected aircraft”, and “intercept and destroy any enemy aircraft” (launch fighters or a surface-to-air guided missile to destroy the invading target in the air). Almost all airspace around Japan is constantly monitored by the Aircraft Warning Control Force using radar and the airborne warning and control system (E-767 and E-2C/D Hawkeyes) to detect invading aircraft as quickly as possible. Next, detected aircraft is identified as a friend or foe by the automatic control and warning system, etc. When an enemy aircraft is identified, the aircraft control and warning system determines where the target should be destroyed, alerts the combat aircraft on standby on the ground or in the air and surface-to-air guided missile troops of the Ground and Maritime Self-Defense Force, and destroys enemy aircraft by an air controlled, guided combat aircraft, and surface-to-air guided missiles. 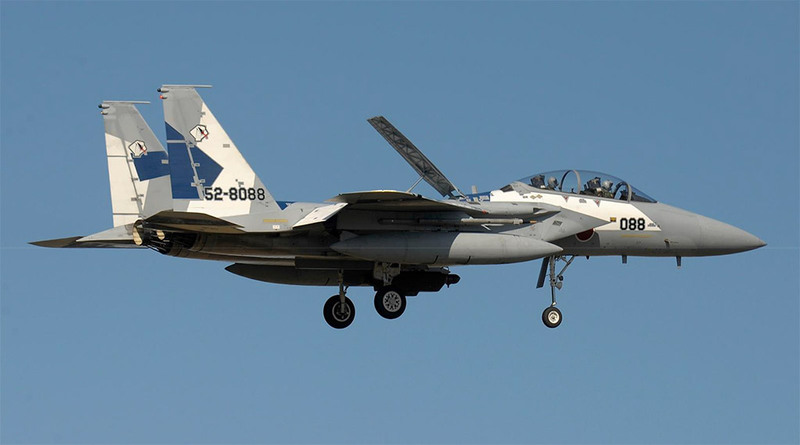 The Boeing (Mitsubishi) F-15CJ fighter jet can be called the central core of air defence, supported by the old but updated F-4J Phantom II and the local built Mitsubishi F-2. 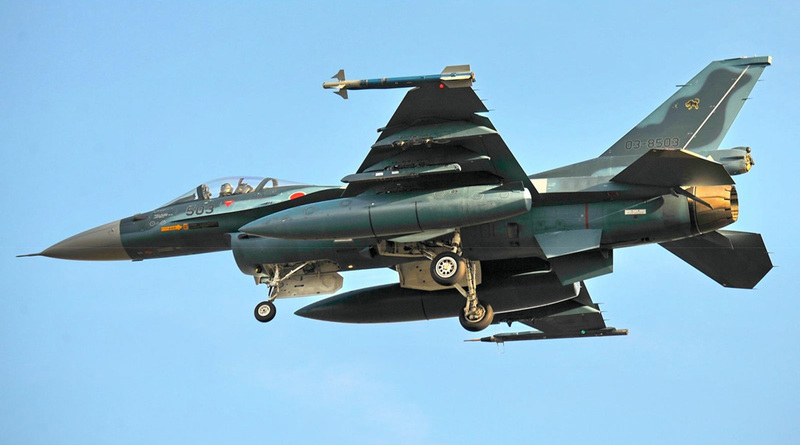 JASDF fighter troops are comprised of 12 wings and about 260 fighters in order to quickly respond to various situations. For the immediate and appropriate measures during an airspace incursion, its modernization continues. The American 5th generation stealth fighter jet Lockheed Martin F-35A Lightning II is going to enter in service in 42 units to replace the F-4 fleet as part of the new-mid-term defence plan considering the financial conditions. 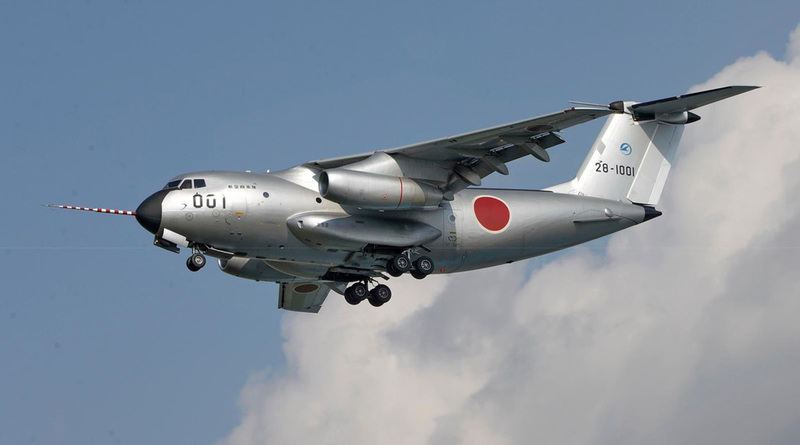 Also, since Japan is geographically made up of many islands and in order to appropriately handle an invasion to them, the new transport aircraft Kawasaki C-2 will replace C-1 aircrafts, rescue helicopter and C-130H transport aircraft will be equipped with aerial fuel-receiving and refueling functions, and the aerial refueling and transport troops will be newly established with the deployment of aerial refueling and transport aircraft Boeing KC-767J, very similar to the in-service Italian Air Force KC-767A model . Japan worked a lot to convince American administration to sell the Air Dominance Fighter Lockheed Martin/Boeing F-22A Raptor but the segregation of this project got always a negative response from the last two American presidents. The risks in the Pacific and the threats that could get instability in the Far East are seriously taken by the Japanese government and the interim solution could buy more F-35 stealth jets and develop a self-made 5th generation aircraft. The test-bed plane SHINSHIN could see Japan taking the road to developing its own stealth aircraft more dedicated to the air defence. The costs to develop a new engine and the technology of a new stealth fighter jet are really high and there are doubts that Japan will run this road; cooperation is possible, but it needs to find a partner, define requisites, put resources on a table and develop technologies in a reasonable timeframe. 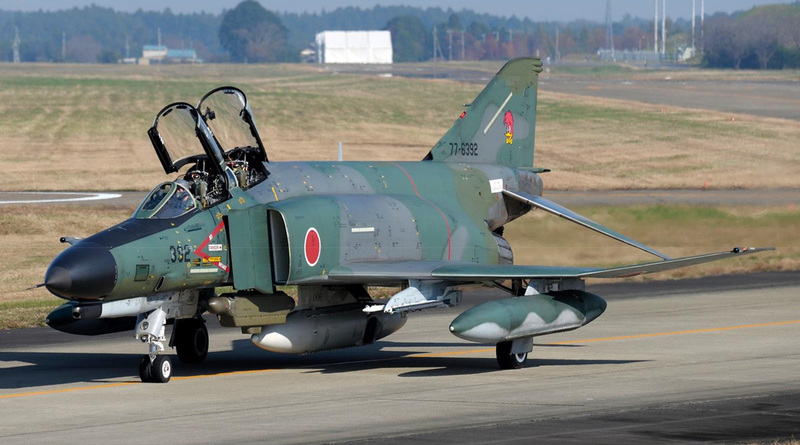 The Japan Air Self-Defense Force acquired the McDonnell-Douglas F-4E “Phantom II” in 1968 and, according to its use, designated him F-4EJ. The Japanese version licenced by the American company (now Boeing) and built by Mitsubishi had several differences compared to the aircraft in service with USAF and USN, being initially intended for air defence only (similar to what happened with the Phantoms supplied to West Germany). In the following years, Mitsubishi delivered 138 Phantom II. Later, 14 reconnaissance model RF-4Es were also purchased in the United States. The Phantoms were acquired to operate alongside the Lockheed F-104 Starfighter, which was the main fighter of JASDF during years the sixties and seventies; compared to the Starfighter, the Phantom would have allowed a greater range of action and more safety in operations on the sea, thanks to the two turbofans General Electric J79 and better capacity all-weather using radar-guided air-to-air missiles. 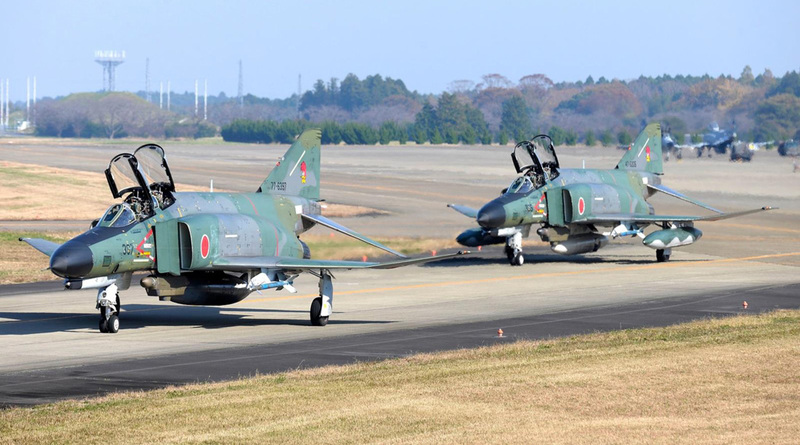 The F-4J equipped seven Squadrons (Hikotai, in the Japanese language). The first wing equipped was the 301 Hikotai of Hyakuri; the first two aircrafts arrived on August 1, 1972 with another nine delivered at the beginning of the following year. Two of the latter were transferred to the Air Development and Test Command. 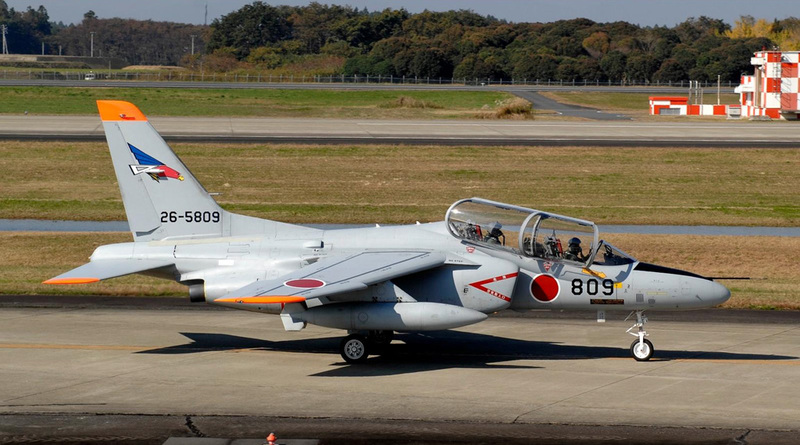 The 301 Hikotai began the training on October 2, 1973, and two weeks later he was declared operative with six F-4EJs and two T-33s (primarily intended for connection tasks and used as targets during air simulations. Two of its aircraft were assigned almost permanently to the ADTC for assessments related to the use of AIM-4 “Falcon” and AIM-7 Sparrow III air-to-air missiles. From 1974 to 1976 more than 30 Phantom passed through 301 Hikotai awaiting distribution to other wings. On October 30, 1978, the 301 Hikotai was tasked to the QRA (Quick Reaction Alert) mission for the defence of the national airspace and the first real interception took place on February 21, 1979, when the Phantoms intercepted a Soviet Tupolev Tu-95 Bear. On October 16, 1973, when the 301 Hikotai celebrated its 10th anniversary, it had already been responsible for the training of over 500 pilots of Phantom. In 1984 the Squadron moved from Hyakuri to Nyutabaru to prepare the arrival of the new F-15 air superiority jet, thanks to which the air force made a further leap in quality, passing from the 7th Wing to the 5th. The 302 Hikotai was formed on July 18, 1974, receiving six F-4EJs and two training T-33s. Assigned to the 2nd Wing, it was declared operative on October 1, 1975. The 302 Hikotai was the second JASDF interception squadron and the one that, being based in Chitose, was the northernmost, closest to Eastern Soviet Siberia; on 1 November 1975 he was then qualified for QRA missions. In 1979 the F-4s of the 302 Hikotai were painted in a mimetic scheme that differed from the one previously applied, to better adapt to the northern environmental conditions. For the camouflage, three alternative schemes had been evaluated and the one in two shades of blue was chosen. Every year the department conducts the “Cope North” exercise, complex manoeuvres with USAF fighters coming from the Japanese or Hawaii bases. In October 1984 the Squadron celebrated its tenth anniversary and a year later, in November 1985, it was transferred from Chitose to Naha (Okinawa) on the Ryukyu islands, passing a completely different, almost tropical operating scenario, located less than 1,000 km from the coast Chinese. The delivery of the first two Phantom to 303 Hikotai took place in August 1976. Already in October of the same year, the Squadron was declared operative with 16 “Phantom” in staff; assigned to the 6th Wing, was in charge of the QRA on June 17, 1977, and during one of these interception missions, on June 27, 1980, a Soviet twin-engine Tu-16 crashed near Komatsu (apparently due to unsafe flight’s conduct, without that there had been no direct actions by Japanese fighter jets). 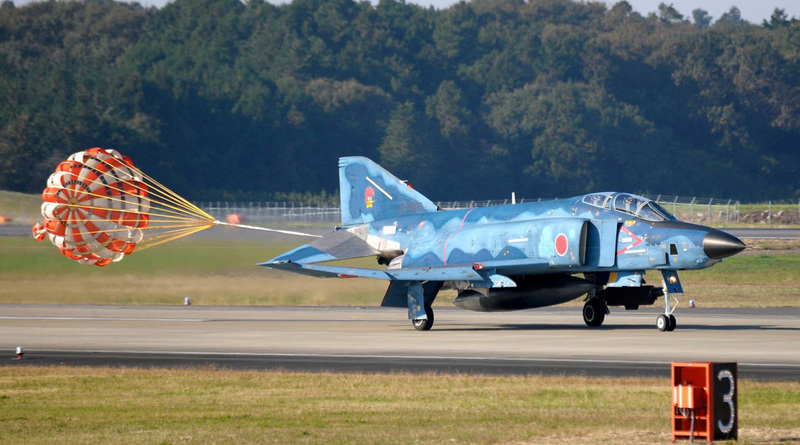 The last Phantom delivered to JASDF was taken over by the 303 Hikotai on 21 May 1981. Ten years later, the Squadron completed the transition to the F-15 Eagle fighter jet and on August 1, 1977, it was the time of the 304 Hikotai declared operative with 18 aircraft. The department was subordinate to the 8th Wing, based on Tsuiki, Kyushu island that is the most southern of the major ones. During the early 1980s, the Air Self-Defense Agency required some upgrades and new capacities for the F-4EJ fleet; the upgrading program called “F-4EJ-Kai upgrade” seen the modernization and redevelopment began in July 1984 having in scope to maintain the operational validity of the planes until and after the new millennium. 96 F-4EJ received the heavy mid-life update program that included the more capable Westinghouse AN / APG-66J pulse Doppler radar, much smaller than the original Westinghouse APQ-120. Externally, the installation of the new radar (incidentally, a version of the F-16 radar) can be distinguished by a new radome with reinforcement ribs. Among other things, this upgrade program followed a similar to what happened to the German Phantoms. Japan and Germany suffered heavy restrictions having lost World War II: they have been authorized to fly only airplanes with defensive capabilities. During the cold war, all the limitations have fallen and the F-4 jets in force with West Germany and Japan could extend the operational activities and carry on air-to-ground ordnance. The F-4EJ-Kai also received a new computer, a new CPU, a new HUD (Head-Up Display), a Hazeltine AN/APZ-79 IFF and a Litton LN-39 inertial navigation system. In addition, a new J/APR-6 Radar Warning Receiver (RWR) was mounted on top of the drift with antennas for the front sector at the wingtips. Communication skills have also been improved using two larger UHF antennas (one dorsal and one ventral). The modified planes were made compatible with the 2,309 litres ventral auxiliary tank of the F-15, allowing a higher load factor including a higher number of g. The advantages in terms of logistics were also obvious. 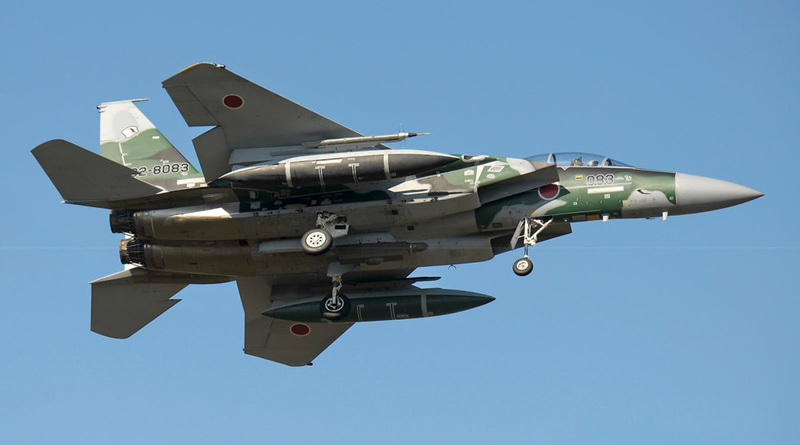 Another feature of the F-4EJKai is the ability to use the Westinghouse AN/ALQ-131 external countermeasure electronic pod that has a wide range of modules and a reprogrammable software that makes it capable of quickly adapting to the new threats. Responding to the new anti-ship attack mission, the ordnance capabilities have also been increased, and the Mitsubishi ASM air-to-surface air-to-air missile can now be carried along with the Air-to-Air short and medium-range missiles. The Phantoms didn’t receive the projected “slatted wings” due to costs. The RF-4EJ recce version received a mid-life update as well. The update was similar to the standard operational version and the original APQ-99 radar replaced by the most capable APQ-172 new electronic suite and a new Head-Up Display (HUD) were part of the incremental package. The “new” F-4EJ-Kai flown on July 17, 1984, and the first production plane has been delivered to Hikotai 306 on November 24, 1989. Only 96 planes on 110 had been updated. 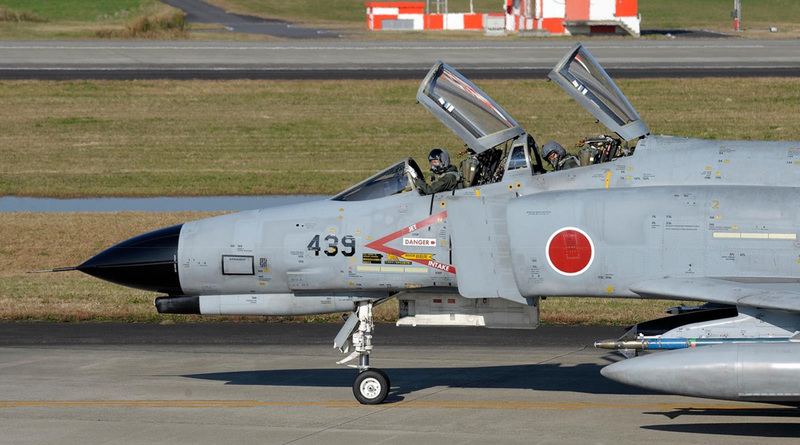 In late 1990s, three JASDF Squadrons were equipped with the F-4EJ-Kai: 301 Hikotai in Nyutabaru (Kyushu), the 302 Hikotai in Naha (Okinawa) and the 306 Hikotai in Komatsu (Honshu), with the 306 Hikotai who had begun to replace his F-4 with the American-built F-15 Eagle. The situation today is seeing two Squadrons of F-4EJ and one mounting RF-4EJ aircraft. Currently, less than 90 F-4 are operational. With the purchase of the 5th Generation, American built Lockheed Martin F-35A Lightning II stealth jet, the Phantom’s sunset seems to be behind the corner closing a great era. The first F-35s are currently in production in the United States and Japanese pilots and airmen are receiving the training at the F-35 school at Luke AFB, AZ. The second F.A.C.O. (Final Assembly and Check-Out) plant outside us is located in Japan and it just started to assemble the Japanese F-35, two of them already rolled-out. The Joint Strike Fighter is a game-changing in the turbulent Pacific area and for sure will help JASDF to increase its capabilities and accomplish its mission within the Self-Defense Forces.